Army Recruitment Rally Mananthavady Kerala 2016, Indian Army Rally Kerala Online Registration and Online Application form, Mananthavady Army Recruitment Rally April 2016, Next Army Recruitment Rally Kerala 2016, Download Army Recruitment rally admit card, Mananthavady Army rally Results, Karasena Rally Mananthavady. Indian Army is conducting a recruitment rally at GVHSS, Mananthavady on April 7 to 17, 2016. Candidates who are interested to attend the recruitment rally at Mananthavady must submit the application online through www.joinindianarmy.nic.in. The online registration / submission of online application for Mananthavady Recruitment rally 2016 will be started from 7-02-2016 to 22-03-2016. The candidates from the districts of THRISSUR, WAYANAD, KOZHIKODE, MALAPPURAM, PALAKKAD, KANNUR, KASARAGOD and MAHE can be attended the army rally at Mananthavady Kerala. More information regarding Mananthavady recruitment rally venue, rally dates schedule, educational qualifications, age limit, Online Registration procedures etc are given below. 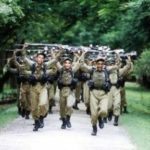 Indian Army Recruitment Rally Kerala 2016 Mananthavady online registration will be started on February 7th, 2016. Candidates who are interested to attend the recruitment rally must submit the application online through www.joinindianarmy.nic.in from 7-02-2016 to 22-03-2016. Instruction / procedures for online registration are available at http://joinindianarmy.nic.in. 1. Admit card (Download the admit card from army site). 2. One copy of the print out of filled online application duly singed and affixed photograph attested by Gazetted Officer thereon and 10th class certificate, 12th certificate, all in original along with two attested photocopies of all the above certificates are to be carried out to the Selection Centre by the candidate. Original certificates will be returned to the candidate after verification by the Selection Centre. More details about rally contact ARO office or visit www.joinindianarmy.nic.in.